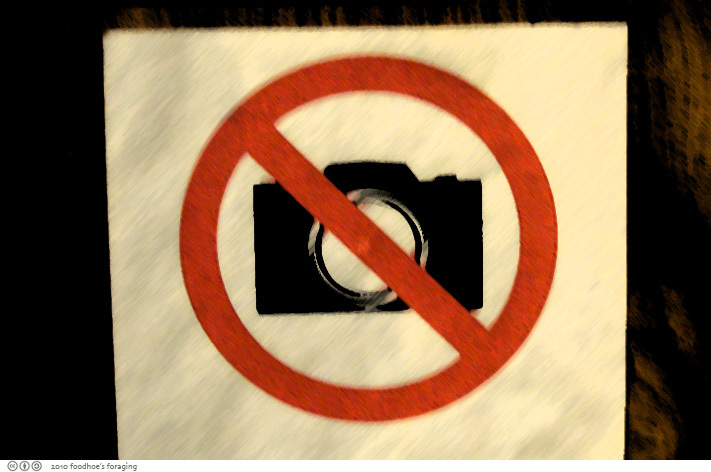 However, there was a woman with a tripod and big DSLR clicking away, which seemed to contradict the sign… I tried to keep it on the down-low and take photos when no one was looking, but was busted a couple of times; however, the staff was cool about it. Do you think less of me for disrespecting the rules of the restaurant? Okay then, let’s move on shall we? 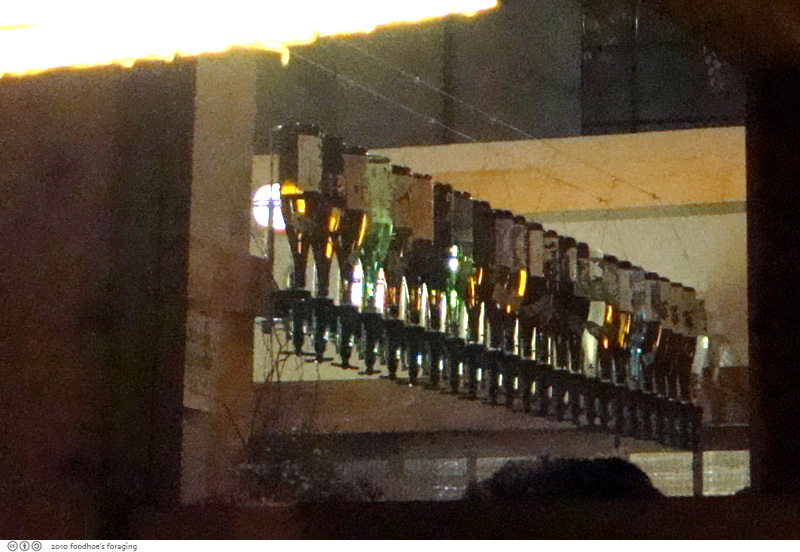 Here is the much talked about Sake dispenser at the bar area in the front. The interior is modern but traditional with high ceilings and beautiful clean architectural lines. It’s dramatic in a way and definitely sets the mood. 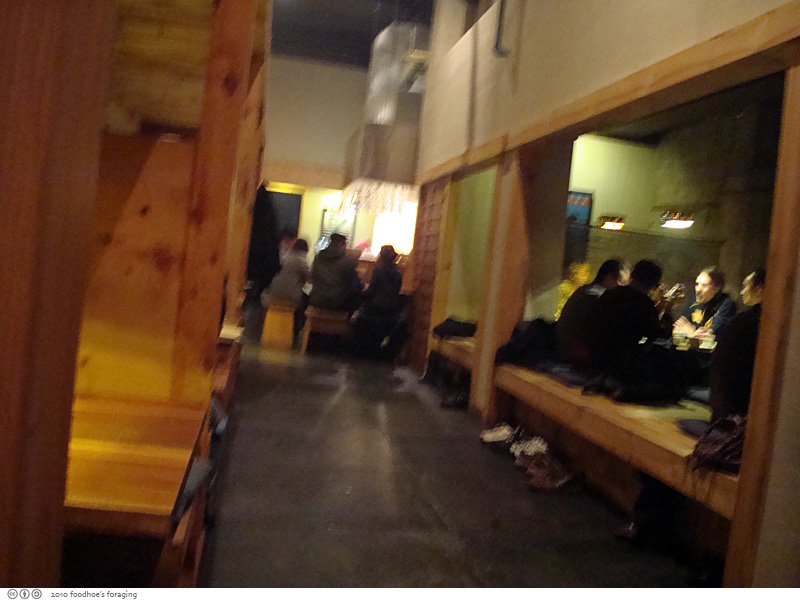 At the rear of the restaurant is an open kitchen where you can see the chef busy with a multitude of skewers. I got there first and was seated in a cozy booth which provided a fair amount of privacy. 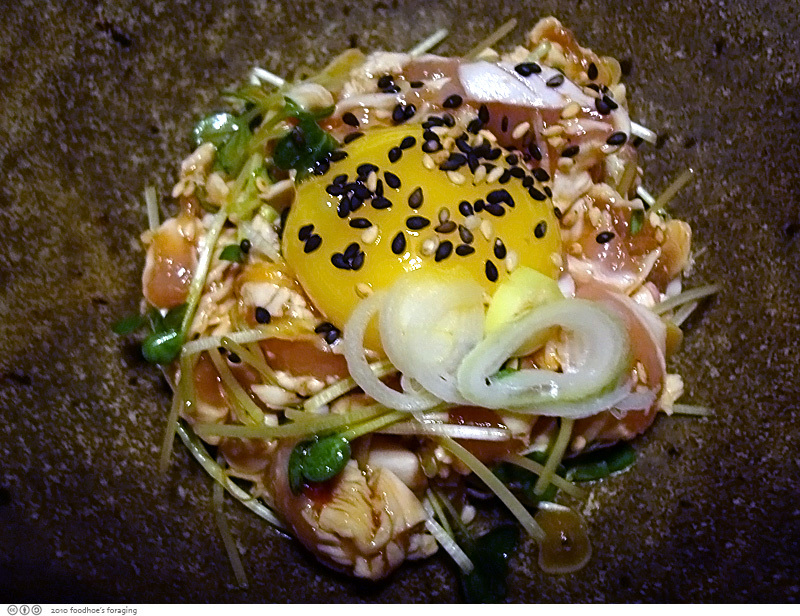 I ordered the Chicken Tartare tori yukke ($9) while I waited for the Single Guy. He already told me he was grossed out by it and to go ahead without him. Oh and fyi, they offer half off drinks during happy hour which goes until 6 pm and includes a shochu flight for $6. The server dropped off a wedge of raw cabbage with a miso mayonnaise which was fun to peel off in layers and provided a light vegetal crunch. We decided to share the Omakase Gushi or chef’s selection of 5 sticks ($14): wings (the empty skewer on the far left), breast, gizzard, neck and thigh with leek. 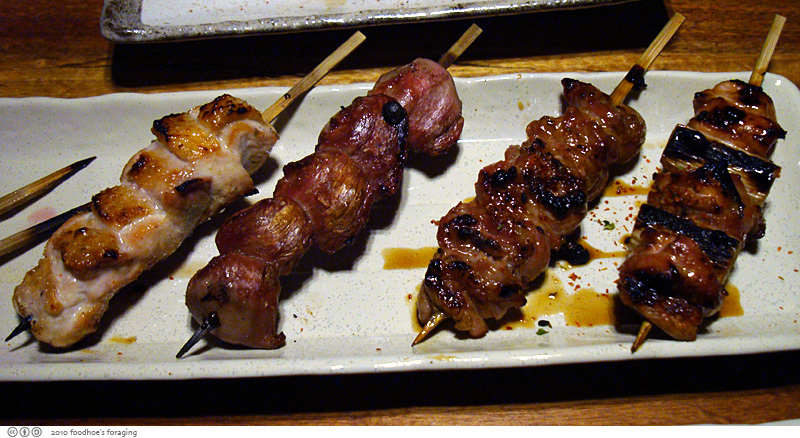 The skewers are dipped in a tare (sugary soy-mirin marinade) and grilled over special charcoal, and you have to be careful not to burn yourself with the hot juicy chicken joy. 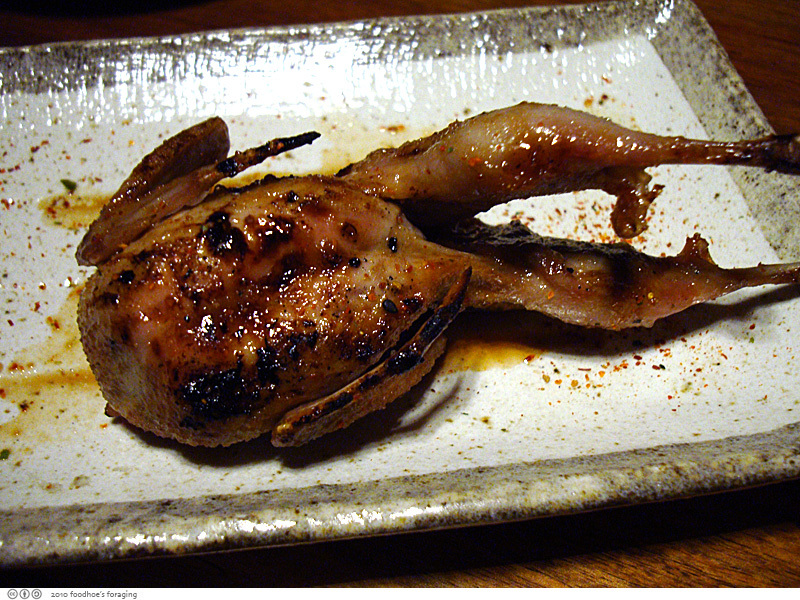 I loved the chicken neck (nakaochi) and thighs with leeks best. The gizzards were tough and almost crunchy and were not my favorite. I must come back to try the chicken livers and cartilage, there were many other interesting dishes besides the grilled chicken sticks too. 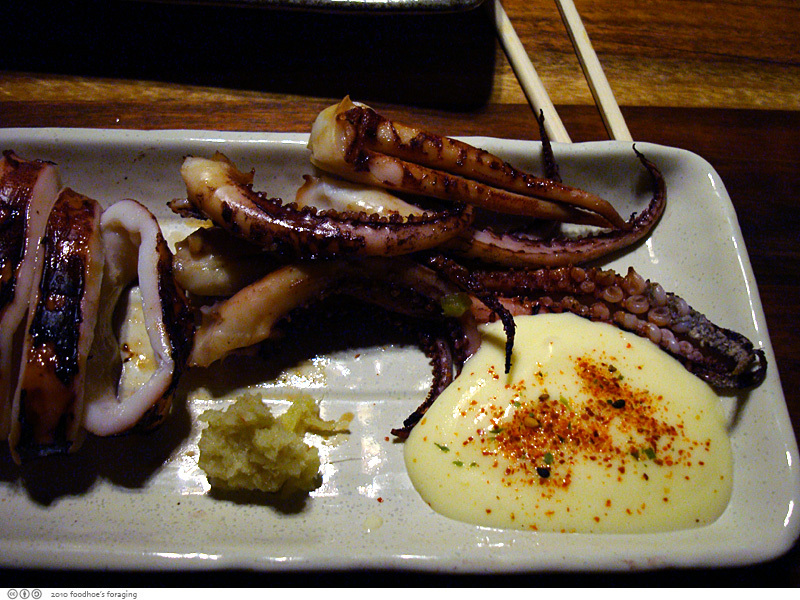 We shared the Grilled Calamari Ika Yaki ($10) which came with a rich aioli sprinkled with shichimi togarashi and separate mounds of grated ginger and yuzu peel. We dipped the meaty pieces in one or the other, but I didn’t think to mix them together until the last piece, it was way better mixed… something to remember. 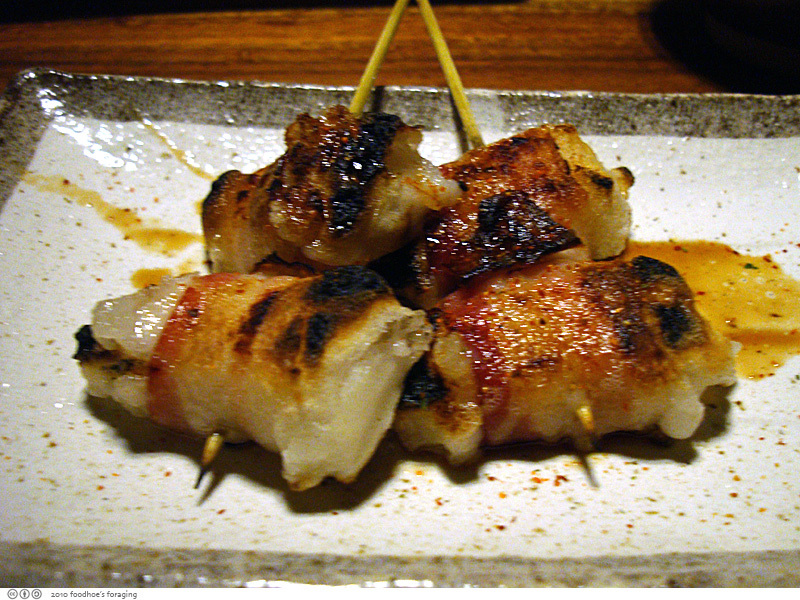 The Bacon wrapped mochi balls Bekonmochi ($5) were interesting but the bacon was paper thin and while it formed a crispy skin against the sticky mochi, we couldn’t really taste the bacon. I loved the sugary soy sauce that coated it. 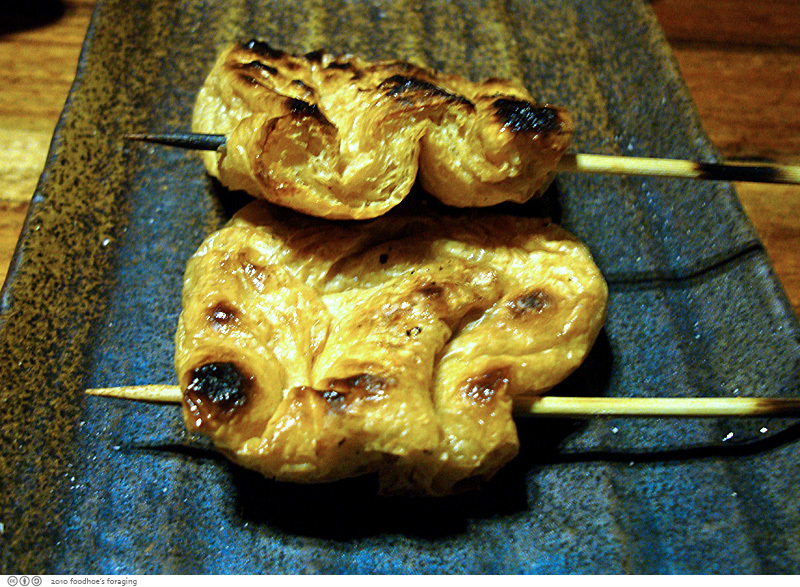 I grew up eating toasted mochi dipped in sweetened soy sauce. That is one of my all time favorite snacks. 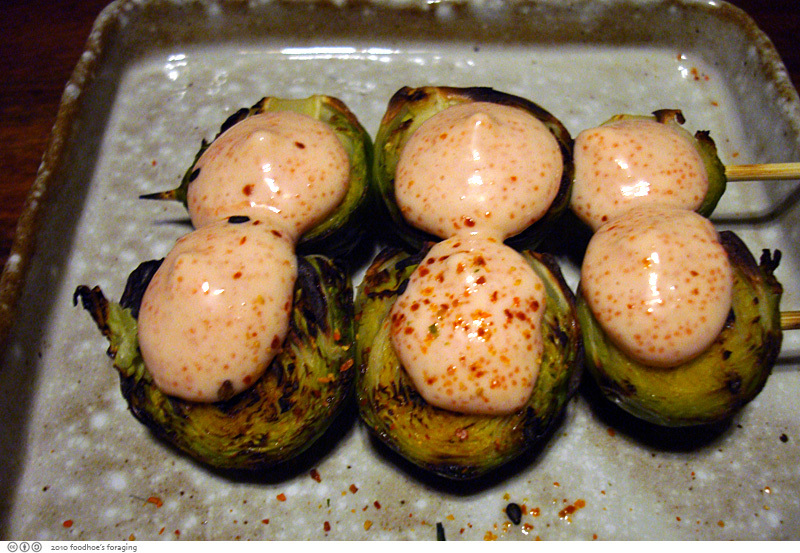 Brussel Sprouts Mekyabetsu ($5) were topped with a creamy mayonnaise spiked with spicy cod roe and dusted with chili powder. This was our vegetable dish, it seemed so simple and was not as interesting as the other dishes. 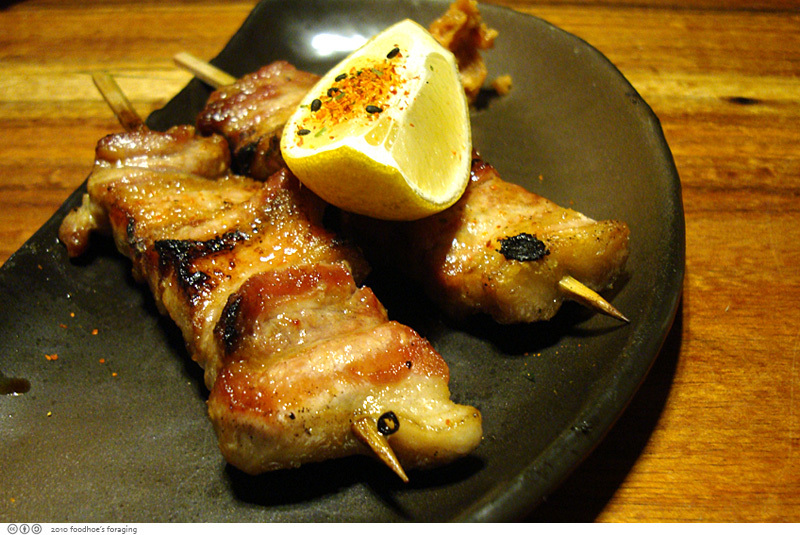 We finished with Pork Belly skewers Buta Bara ($8) which were served with a sweetened miso paste. It wasn’t the succulent fatty chunks falling off the skewer experience that I was hoping for, but I was quite full by that point. 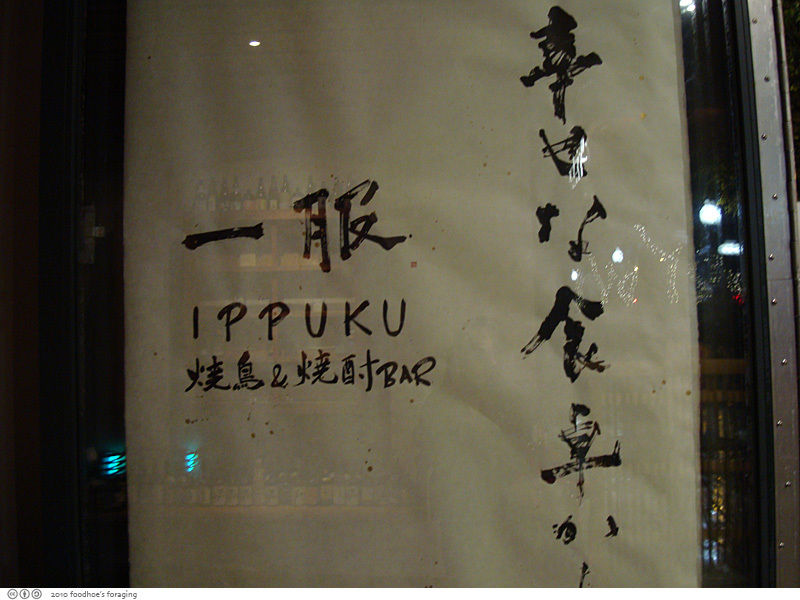 There is a section on the menu with rice and noodle dishes that are typically served at the end of the meal. 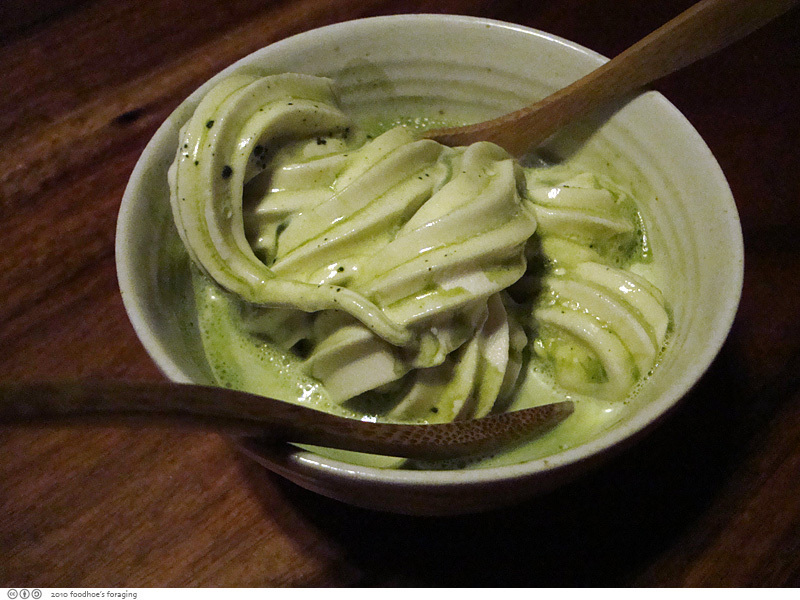 We shared the Matcha Affogato ($8) – green tea over Strauss’s vanilla soft serve ice cream ($6). We thought the matcha was very weak, the comparison would be a cup of coffee poured over the ice cream versus a shot of espresso… the soft serve ice cream was good, but we also bit into little chunks of ice in it. Dinner was around $50 each, kinda pricy, but I’m willing to pay more for quality ingredients and skillful preparation, especially when dining adventurously. 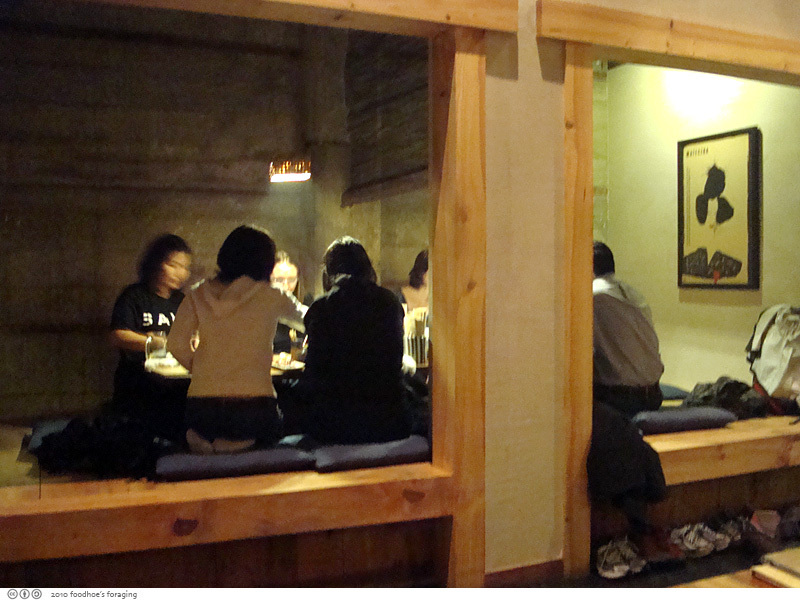 Across from our booth was a dining area with raised floor that is called kotatsu style and allows for a recessed area under the table to rest the feet. It brought back memories of sitting at the cozy kotatsu in Japan, which is covered by a heavy blanket with a heater underneath. As the evening progressed, the room filled with smoke from the grills which almost made my eyes water. I hope they get better ventilation… but that won’t deter a return visit soon. I forgot to post this picture of the Grillled Natto filled Tofu pouches ($5), which I ordered out of curiosity. Tofu pouches are normally tender and spongy but were grilled until they were almost dry and flakey and had a slightly bitter taste. There was just a tiny bit of natto inside, which stretched out with tiny spider web filaments when I took a bite, but had very little flavor. It could have used some kind of sauce as I found it to be dry, but perhaps it is the type of dish that goes down best with a swig of sake or shochu. Single Guy Ben hadn’t had natto before and I think he had some apprehension, but found it to be quite tame. Scrummy dishes! Every dish looks lip-smackingly good. You’re definitely gutsy for ordering the Chicken Tartare but everything else (especially the octopus!) looks amazing! I also just LOVE green tea ice cream! You really have guts, I consider myself an adventurous eater but chicken tartare is extreme. I can’t imagine the texture even though you describe it very well. Did it have any of the raw chicken metallic smell or was it masked by the sesame oil? 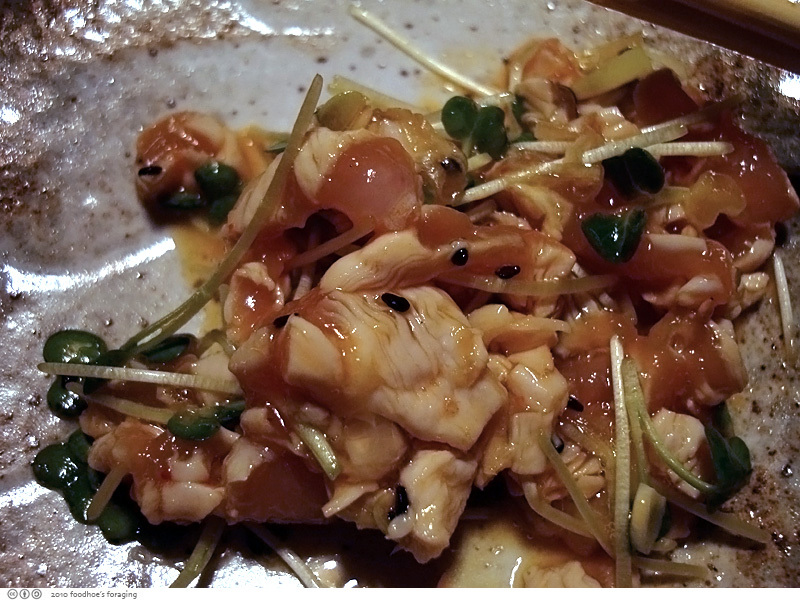 I had rare chicken at Raku in Las Vegas and I was up worried all night about stomach problems. I like the place, but I do recommend eating early to avoid the smog of smoke from the grill later in the evening, which can seem stifling. Thanks for being my co-conspirator in the photo taking! cookie, the tako yaki was so good and ditto for me on green tea ice cream. I wonder if you can get soft serve anywhere? bonnibella, it was very similar to poke! no metallic taste at all, maybe the hot water bath removes it? Strangely enough, I went to Japanese for lunch and dinner the next day and was kind of waiting to see if I would explode or implode, but nope I’m still here! i spy with my little eye LOTS of nicely-charred food. excellent find! LOL! You’re such a delinquent, Sandy! And no, I don’t think less of you at all. You’ve got big balls, honey!